Black Cat Music offers a wide range of sheet music stands with the comfort and convenience of the musician in mind, as well as a wide range music stand accessories such as stand lights, storage bags and storage carts. Wenger music stands are built to withstand wear and never wobble. From the nearly indestructible Bravo music stand that won't chip or dent to the traditional elegance of the Classic 50 stand to the Roughneck stand, which is still the standard for quality metal performance. 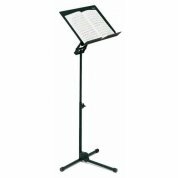 Now Wenger has added the new Preface music stand - the reliable, lightweight stand with an economical price. It features one-hand adjustment and a wobble-free base. The recess in the desk tray allows for stands to nest tightly for storage. 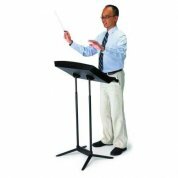 RATstands music stands are renowned for their quality and durability. The Jazz stand is a professional quality music stand with a full range of height adjustment, industry standard stability and a full-size music tray with pencil shelf. And yet, as a result of its unique design, it unfolds in three easy moves from a flat pack no larger than the size of the tray. It does this with no knobs, no finger traps and no hassle; just three easy moves. The Concert stand's combination of slender metal stem and natural wood tray perfectly complements the appearance of a modern or historic concert hall. The tray is formed in one piece from natural birch and lacquered to the colour of beech. Friction locks automatically hold the tray at whatever angle you set. There are no knobs to fiddle with or lose, and it will never go slack. The Opera stand from RATstands is unique. It was designed from the ground up as an illuminated music stand. The advantage this gives it is that every lamp is designed specifically to work with the music stand. Super-tough black nylon coating makes the stand a pleasure to touch and, unlike other coatings, never chips. For more information about any of our music stands and related products, please Contact Us or give us a call on 01892 619719. 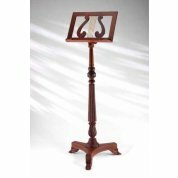 The Victorian Music Stand is part of our range of inexpensive, period style wooden music stands. Made to the highest standard from solid Walnut, they are replicas of traditional music stands which, for over a century, have been popular with musicians and antique collectors alike. The reliable, flexible, stable travelling music stand! The Gig Music Stand is supported by a broad, three-legged base to keep it stable and has a built-in handle for easy transport when out on the road.